- 10 % discount until 15 May 2018! Location: Costa Bulgara Complex is situated in ”The Kings' bay”, between Chernomoretz and Sozopol, on the territoty of ”Aklady”. 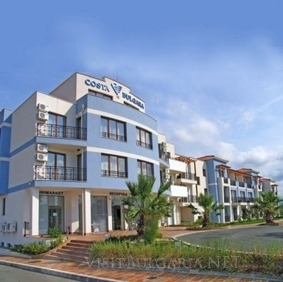 Accommodation: This seaside apartment complex in Bulgaria includes 8 buildings with 160 luxury designed and elegantly furnished lodgings, ideal for a romantic break, a family vacation or for friends who travel together. On-site facilities include outside swimming pool, bar, restaurant and garden area for relaxation, parking places, a conference hall, a shopping centre, a children playarea, a restaurant with enchanting sea view and beach bar. On the beach guests will have the possibility to practice summer sports such as windsurf, water-ski, jet-ski and beach volleyball.